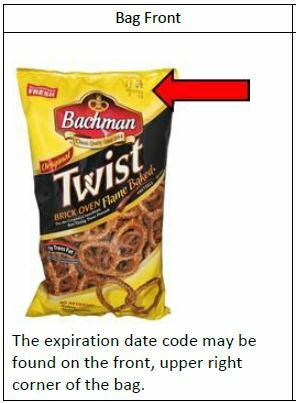 Hanover, PA – Utz Quality Foods, LLC., is voluntarily recalling a specific expiration date code of Bachman® 10 oz Twist Pretzel packages due to undeclared milk. This recall was initiated after reviewing production records which identified a small number of packages were mislabeled. People who have an allergy or severe sensitivity to milk may run the risk of a serious or life-threatening allergic reaction if they consume this product. The item subject to this voluntary recall was distributed to retail outlets in the following states: CT, DE, MA, MD, ME, NC, NH, NJ, NY, PA, RI, VT, WV. Please see below for an example of reading the expiration date code and UPC code. No other Bachman® products are being recalled. Email: Customerservice@utzsnacks.com or, call 1-800-367-7629. Monday through Friday 8:30 am to 5:00 pm Eastern Time.